St. Francis Receiving the Stigmata by Jan van Eyck, ca. 1432. Francis of Assisi is synonymous with the abandonment of wealth to follow Christ. This very early masterpiece by van Eyck shows him at the extreme, when he would not even wear sandals. Another great song from JJ Heller. O God, the Father of our Lord Jesus Christ, our only Savior, the Prince of Peace, I have tried to read your Bible and find your Word and your will for me, and to study it. But I think so many thoughts about it, and then I start to think I know something, and then I see another church or hear a pastor or read something, and I think, “that person is wrong”. Or the pastor of my church or a Bible teacher will tell me one thing, and then somebody else will tell me something completely different. Please, dear God, help me and every person who confesses Christ as his Lord and Savior, not think that they know everything and get into arguments with each other. Let us always remember that it is not other Christians who are our enemies, just because they think something different, or baptize people differently, or have different ideas about sacraments or church leadership or whatever foolish doctrine we might fight about. Let us always remember that there was one Christ, one baptism for the forgiveness of sins, and one church. Heal any and all divisions between Christians, Holy God. 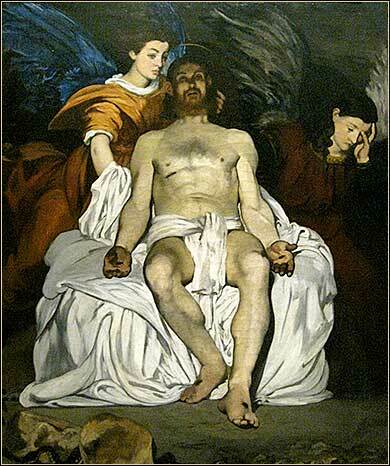 The Dead Christ with Angels by Edouard Manet, ca. 1864. Where Presence — is denied them. There has sprung up a Biblical “urban legend” that the “eye of the needle” was a narrow gate in Jerusalem, used after hours; in some versions a camel can get through it, only when all packs have been removed and it crawls on its knees; in others, such a large animal cannot fit. More likely, Christ's words are not a reference to anything else. In Hebrew stories of the time, the eye of a needle and a large animal (usually an elephant) are used as an outlandish metaphor for impossibility. And we have seen Jesus use outlandish metaphor previously. Who hasn't wondered at the image of a person with a “beam” or even a “tree” in his own eye, criticizing the speck in someone else's? But then He qualifies what He has said, for God could allow a camel or anything else to fit through the eye of a needle. So is it impossible to be rich and go to heaven? No. Does great wealth make it more difficult? Without doubt. Paul tells us in 1 Timothy 6:10 that love of money, not money per se, is the root of all evil. But the message is pounded into our unwilling minds time and time again, that we must choose between this world and the next. E.g., “If anyone loves the world, the love of the Father is not in him.” 1 John 2:15. The very early church shared everything. People with land sold it and distributed among others in the church who needed basic support. Acts 4:32-37. But this does not appear to have been mandatory. Acts 5:4. We might interpret Jesus' comments to the young man to apply only because Christ was on earth, since he repeatedly told people to abandon their families and all they knew to follow him literally. We could conclude that after Christ left the earth, as the age of Christ's personal ministry ended and the age of the Holy Spirit began, we can no longer follow the exhortations to “follow me” literally. But we can hear what we want to hear, and we would like to be able to have the kingdom of heaven and a certain amount of material comfort, both. So we run the risk of fudging in favor of keeping our money, or most of it, if we begin to “interpret” the Bible. What good is it, my brothers, if someone says he has faith but does not have works? Can that faith save him? If a brother or sister is poorly clothed and lacking in daily food, and one of you says to them, “Go in peace, be warmed and filled,” without giving them the things needed for the body, what good is that? In practical terms, there are few of us that do not have and spend more than we need. As with sexual morality, the secular god of consumerism is likely to warp our vision. So in practical terms, if we wonder whether we are loving our comforts and possessions too much, and God too little, the answer is almost certainly affirmative. 1 Corinthians 13:9-10: For we know in part, and we prophesy in part. But when that which is perfect is come, then that which is in part shall be done away.